Since I live about 4 hours from the closest Ben & Jerry’s I’m just going to have to live vicariously through you lucky folks who can take advantage of this deal! 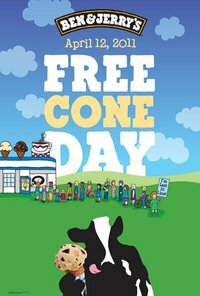 Get a free ice cream cone at participating Ben & Jerry’s on Tuesday, April 12. Be sure to see if your local Ben & Jerry’s is participating in this promotion before you go. You can also download the Ben & Jerry’s Scoop of Happiness app for your iPhone will which guide you to the closest place for your free scoop! Enjoy an old favorite or use this deal to try a new flavor. Just please think of me, eating my paid-for Ben & Jerry’s. From a carton. In a bowl. If it makes you feel better, when I’ve done this before, the free cone is very tiny. You’re probably getting more ice cream in your bowl.